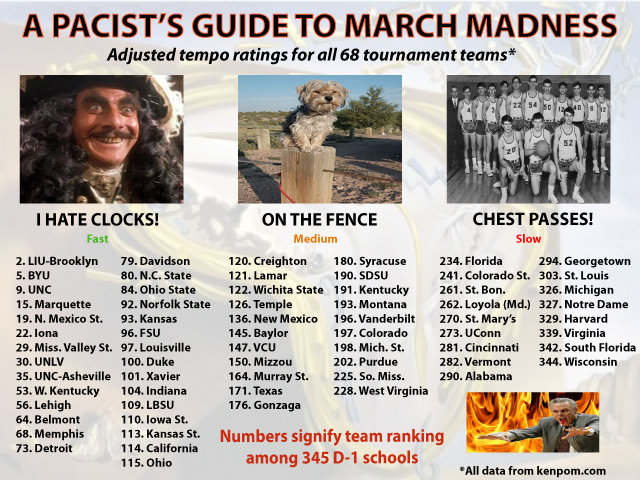 Last week, I broke down the NCAA tournament by states, mascots, and relative pace of each team. This might sound arbitrary, but I’ve talked to several prominent scientists, none of whom stayed on the phone long enough to discredit the system. Now that we’re two (UGH, fine, three) rounds in, let’s see if we can pinpoint the trends and then predict the rest of the tournament. Overall, it was a great weekend for pacists, and it might be about to get better. The three slow teams — Wisconsin, Cincinnati, and Florida — are all significant underdogs in their Sweet 16 games. With any luck, the impurities in the system will be gone by the Elite Eight. It’s also food for thought. It was only natural that the slow group should have fewer Sweet 16 teams, since they had fewer teams altogether. But the two significant questions here, as I see them, are why they had fewer teams to begin with from the same starting size of 115, and why the tournament winning percentage is lower. In an older post about Wisconsin, I spoke briefly about the Badgers’ lack of success in the NCAA tournament, reaching the Elite Eight just once in coach Bo Ryan’s decade at the helm, despite having excellent metrics and a good-to-great record most years. This year, the Badgers are one of the few slow teams to remain alive, but their brethren aren’t faring quite so well. In a format as unpredictable as single elimination, it’s impossible to draw broad conclusions, but it does make me wonder if fast teams are better geared toward March Madness success. On the other hand, it could just be that slow play is a natural response to having less talent, and those teams will usually lose in the tournament. For the curious, the fast teams remaining (starting with the fastest) are: North Carolina, Marquette, NC State, Ohio State, Kansas, Louisville, Xavier, Indiana, Ohio. The medium teams, a group that includes three 1-seeds, are: Baylor, Syracuse, Kentucky, Michigan State. If you didn’t sense it already, this is the part where things stop being even remotely serious. In the old post, you can see that North Carolina had the most teams in the tournament, with five. But a simple majority doesn’t guarantee success, so let’s see which states had the most success, percentage-wise, over the first rounds. Each state’s record is followed by the remaining Sweet 16 teams in parentheses. Weird fact: There were 13 states (and the District of Columbia) in the tournament with just one team. Of this group, none advanced to the Sweet 16. Vowels on the Rise: Teams from states that started with vowels made up just 11.8 percent of the tournament field, despite accounting for 24 percent of all states. But in the Sweet 16, 31.3 percent of the teams are from states that begin with vowels. Resilient. The breakdown last time showed a mascot group that included 38 animals, 22 groups of people, four mythical figures, two colors, one force of nature, and one chant-derived nickname. Apparently the Jayhawk of Kansas is more mythical figure than bird, so we’ll make that 37 animals and five mythical figures. Also, there’s some conflicting information about whether the Buckeyes were named after the people of the state, a la “Hoosiers,” or after the tree. But it’s more fun to add them to the nature category, so I’ll go with that, lowering the people category to 21. Let’s see how they’ve fared so far, with remaining Sweet 16 teams in parentheses. With this information in mind, I’ll now examine the Sweet 16 matchups and make my picks. Indiana plays faster, holding the pacist edge, but in the state category, Kentucky, which is both Union and comes from a very successful state, holds the slight edge. It all comes down to mascots, where Kentucky’s feline animal status gives it the firm edge over Indiana (people, American). Kentucky advances. Xavier belongs to the Union and the most successful state (Ohio), and plays faster than Baylor. That’s two advantages, rendering Baylor’s bear superiority moot. Xavier advances. Both Union states, but Kentucky has fared slightly better than Michigan. Unfortunately for the Spartans, Louisville plays faster and has an animal mascot. Louisville advances. Marquette holds the strong Wisconsin Union advantage, and they also play much faster than the ponderous Gators. Both have animal mascots, and though Florida belongs to the undefeated swamp animal group, it’s just not enough. Marquette advances. Both Union states, but Wisconsin has done much better than New York. Syracuse triumphs easily in the pace department — Wisconsin is the slowest team in the tournament. Slight edge to the Orange as we approach the mascot category. It’s close, but the color categorization of ‘Cuse (2-1 so far) just nips the 22-22 land animal classification of Wisconsin. Syracuse advances. Oh boy. Both from Ohio. Both with strong mascots, animal (30-28) and nature (3-1). But Cincy is a slow team, and this intrastate rivalry goes to the Buckeyes. Ohio State advances. Ohio has a huge state and Union advantage, and the feline Bearcat mascot easily beats the Tar Heels. North Carolina has a pace edge, but it’s only slight. Ohio advances. Great matchup. NC State is barely ahead of Kansas in pace, so a very small edge there. Both states are above average, but Kansas gets a small bump for being Union. It comes down to mascots, where we’re forced to decide between animals (30-28) and mythical figures (3-4). It’s almost too close to call, especially when the canine/lupine category stands at 4-6. In the end, this breaks slightly in favor Kansas when we consider that it belongs to the “unknown” category of mythical figures, rather than good or evil. Boy, this was a doozy. Kansas advances. Kentucky takes the mascot edge easily, but Xavier enjoys a pace advantage. That brings it down to states, where Xavier’s Ohio status just puts it ahead of Kentucky. What an upset! Xavier advances. Both animal mascots, both birds, so no advantage there. As far as states go, undefeated Wisconsin has the edge, so it’s Marquette by one. It comes down to pace, as it should, where Marquette out-fasts the Cardinals by a healthy margin. Marquette advances. There’s no contest in the state department, with mighty Ohio crushing New York. As far as mascots, nature holds a small edge over colors, and the Buckeyes even win on pace. A total blowout! Ohio State advances. Again, the state category goes automatically to the Ohio team, putting the Jayhawks at an early disadvantage. But Bill Self gets his team right back in the mix by winning the pace category, just slightly, over Ohio. In dreaded mascots, however, where mythical figures are just 3-4 (2-1 for the unknown category), they simply have no chance against the Bobcats (30-28 animal, 9-6 feline). A heroic run, but it has to come to an end. Ohio advances. The Golden Eagles must feel like the odd man out in a Final Four with three teams from Ohio, and they start off, of course, by losing the state category. But the Golden Eagle mascot gets them right back in the swing of things, defeating the Musketeer. It comes down to pace, where Marquette is ranked 15th to Xavier’s 101st. Buzz Williams has done it again! Marquette advances. A matchup for the heart of the state. Obviously, that particular category is a draw. In mascots, the Buckeye nature category is a virtual tie with the feline animal Bobcats. That leaves just pace, yet again, and here Ohio State trumps its in-state rival. What an exciting pair of Final Four games, the likes of which we haven’t seen in years. Ohio State advances. I’m almost too excited to breathe. Let’s start with states, where we know the Buckeyes will grab an early 1-0 advantage. 8-0 beats 4-0, whether we like it or not. But that’s never stopped Marquette before, and indeed, they strike a blow against the Buckeyes in the pace category, beating them handily. It comes down to the mascots, where nature beats the animals of the air (6-6 on the year). And that will ground the Golden Eagles, who shall perch no more on the Buckeye tree. Ohio State wins. Pacist-Stato-Mascotism has predicted the last 17 national champions (as far as any of us know), and this year it seems the math will crown the Ohio State Buckeyes. You may now enter your Sweet 16 pools with a clear mind, and also, you’re welcome.